Thank you to everyone who has reached out to me about labral tear hip surgery here on the blog and on Instagram / Facebook. It seems like there are a lot of us with torn labrums who are seeking relief. 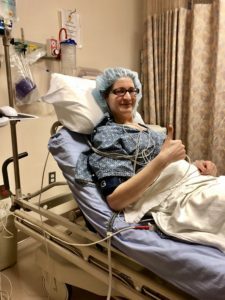 My right hip labrum tear was diagnosed in the fall of 2017 and I had surgery at Massachusetts General Hospital (MGH) in April 2018. I also have a tear in my left hip labrum, but have not had surgery on that side yet. Now that I am one year out from hip labrum surgery on my right side, was it worth it? 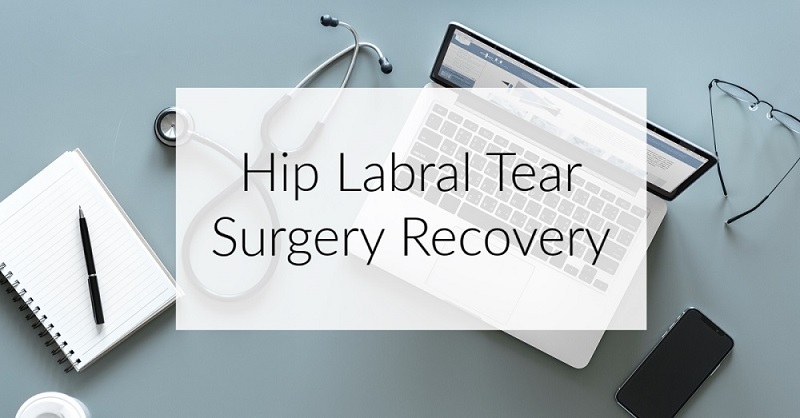 I’ll recap my whole journey in this post, and offer my experience with labral tear surgery. Along with the history of my diagnosis and recovery, I also offer a bunch of tips about hip surgery preparation and recovery. I honestly had not idea what to expect after hip labral tear surgery, so I really hope this helps answer a few questions you might have. Before my two hip labral tear diagnoses, I was really active in the gym and especially loved lifting legs. There was nothing more exciting to me than leg day! I was also a spin instructor for several years and taught 1-3 classes per week at my peak of teaching. However, a few years ago, I started to notice that I could not lift as much weight with my legs, and that my leg strength wasn’t progressing like it used to. I would also have super tight glutes, hip flexors, and piriformis muscles on the right side of my body. I also had a lot of low back discomfort. I would use the PVC pipe to “foam roll” my tight hips and legs since it was the only thing that would loosen up those muscles. I never considered that anything could really be wrong; I thought I was toning my muscles and that’s why they were tight. I kept on going to boxing classes, taking leg-focused HIIT classes, and using the Stairmill at the gym. I’d also lift upper body regularly and do yoga often. However, after an outdoor fitness class in June 2017, I could barely walk. I had so much pain in my right hip, standing up and sitting down was excruciating. I also started to develop sciatica in the right leg, which was both painful and annoying. Whenever my piriformis was tight, my leg would start to go numb all the way down to my toes. After that outdoor fitness class, I sought help and advice from my primary care doctor and a physical therapist as a first step in the summer of 2017. We thought my pain and tightness could just be muscle weaknesses and imbalances. In physical therapy we did a lot of bridging, leg raises, one legged squats, planks, clam shells, and band walks. I could tell my muscles were getting stronger, but I’d still have lots of tightness and tingling. The physical therapist communicated with my primary care doctor and told her I was not really improving and she thought I should see an orthopedist about the hip. Since my PCP was located at Mass General Hospital (MGH), she referred me to one of their well-known orthopedic surgeons. As a first step, I had an X-Ray of the right hip and a dye injection with an MRI in December 2018. They also injected a steroid treatment into the hip. I didn’t really find the steroid injection to be helpful; mainly because the majority of my pain was stemming from my muscles being so tight. They really felt like hard rubber bands and the only thing that would loosen them up was rolling on the PVC pipe. My orthopedic doctor could see in the MRI that I had a hip labral tear on the right side. He also tested my leg strength with a serious of manual tests. For example, he would press down on the top of my leg and have me try to raise it. Or push my leg to the right while I push left. Based on the fact that I had a hip labral tear and a lot of muscular imbalances, he thought I would be a good candidate for hip labral repair arthroscopic surgery. I agreed, because at that point I had been in pain for a long time and knew I couldn’t ever heal the torn labrum on my own without surgery! This particular doctor is also doing a stem cell research project where they extract your own stem cells from your bones during surgery and re-inject them into the hip cavity after he fixes the tear. The theory of the study is that the stem cells will promote more rapid and lasting healing. I signed up for the study because, well, it was free, and also why not? So we scheduled my surgery for April 17, 2018, and I was left to my own devices for the next few months. I went back to PT to keep prepping my core and glutes for surgery. Strangely, I was pretty zen about the whole scenario, and wasn’t super stressed about the surgery itself because I was really hopeful that my pain would eventually end! Physical therapy before surgery was a great way to prepare for hip surgery. We worked a lot on strengthening the muscles that would be unused for several weeks after surgery. We worked on all the things I mentioned above like planks, bridges, one legged bridges, and leg raises. I basically stopped doing stadium stairs, HIIT activities, heavy leg lifting, and spin. Thank goodness I’ve always hated running, because I probably would have stopped that, too! I started doing more walking, yoga, Pilates, upper body lifting, and body weight leg exercises. I noticed that I’d get sciatica if my glute/piriformis got too tight, so I really tried to ramp down anything that would cause that issue to flare up. I focused a lot on core strength and walking. Pilates was a huge lifesaver and it helped build up loads of strength before surgery! My doctor did not provide much in the way of pre-surgical guidance. We did not even have a pre-op meeting, so he didn’t see me between December 2017 and the date of the surgery in April 2018. That freaked me out a bit. So I called and emailed his office to make sure things were still all good. They didn’t really give me any guidance for how to prepare for the hip labrum surgery. They also didn’t give me a post-surgical protocol until like one day before surgery. So I didn’t know what I’d need to do after the surgery. That was pretty annoying, to be honest. 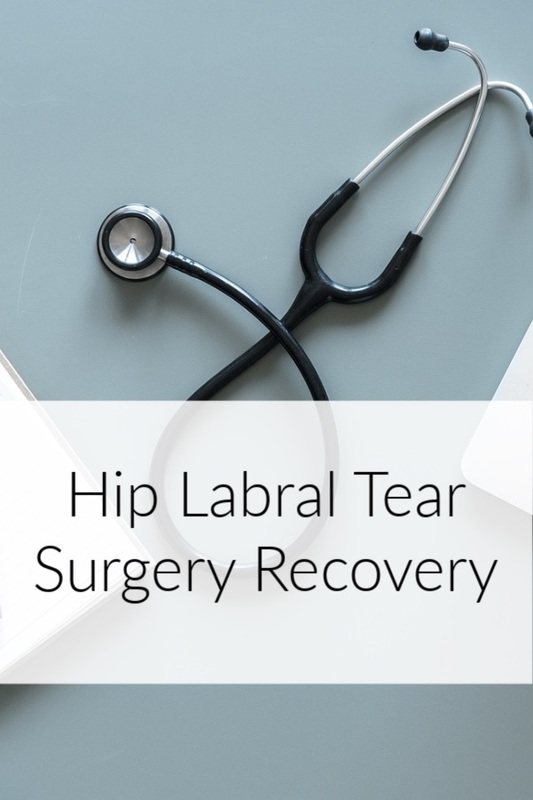 List of items for hip labral tear surgery recovery. I hope this list can help you, too! I updated it a few weeks after surgery to let you know what I really used or did not use. This is only my experience, so yours might be slightly different. The night before my surgery, I had to stop drinking and eating around 8pm. My “call time” was 5:45am with surgery scheduled at 7am. So it wasn’t too hard to just have dinner and stop eating for the night since I was getting up so early. We woke up at 4am, and I showered and washed my hair, since I didn’t know when my next shower would be! We got to the surgical center in Waltham, MA early, and the staff began our check in process. It was mostly a lot of paperwork. They had free and open wifi at the center for my husband to use his iphone or laptop. Next, they brought me back to the prep area where I removed my clothes and changed into a surgical gown. Pro tip: Wear loose fitting clothes and easy to apply items on your surgery day! After surgery they will help dress you and you do NOT want to be wearing anything tight fitting like leggings. Wear loose sweats, slip on sneakers, and a loose top. You will feel like a baby while the nurse helps dress you, but it will make both of your lives so much easier. The nurses walked me through some more questions, and the anesthesiologist came over to ask more questions. Then, the doctor finally came over with Ken and we were able to ask him last minute questions. He described the surgery a bit and what to expect. He then marked my leg with a pen so we both could see that he would be operating on my right hip. Then it was show time! The anesthesiologist gave me the meds to put me under, and that’s all I remember until I woke up in the post-surgical bed. I honestly don’t know how long the surgery took. Maybe an hour or 90 minutes? They tried to feed me saltine crackers after surgery since my stomach was still empty and they didn’t want me getting nauseous from the meds. But my mouth was soooooo dry from being dehydrated. I drank several cups of water and a few crackers. They put a little tab behind my ear, like an anti-nausea patch. We talked a little bit about how the surgery went and what they discovered. It turns out my labrum was torn pretty badly and the flap had doubled over itself. I guess that’s pretty rare, so I felt famous (just kidding!). But it was cool to hear about the inside of my hip joint. Then the nurse dressed me and I was basically ready to go. I did not get much in the way of post-surgical instructions (a theme, it seems). They wheeled me out of the surgical center in a wheelchair and Ken drove us home. I don’t remember it. Pro tip: bring your crutches with you on the surgery day. You will need them to get from your car into the house. Here are a few photos of my torn hip labrum before and after surgery. It was pretty busted up before! 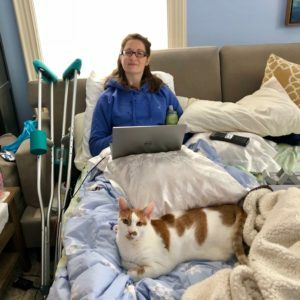 My one sheet of post-surgical protocol was really not detailed, and the main thing it stressed was to not work out or do anything, really, for 6 weeks after surgery. That includes physical therapy. I thought that was crazy, so I still booked PT sessions after my surgery. I really felt like I’d need and want the extra care. Plus, my PT has treated lots of labral tear patients, and she was such an amazing resource for my random questions and for the 900 times I thought I hurt myself or re-tore the labrum. You can read more of the blog posts linked at the end of this post to read more about my journey. But overall, I was basically in bed for 6 weeks probably 18-20 hours a day. I work from home, thankfully, so it was pretty easy for me to just lay in the bed and work. I went to PT once a week where we would do simple exercises like stationary biking for 5 minutes, leg raises, and massage. For the first 6 weeks I was on crutches, which was the most annoying part. I read on other blogs and websites that people were on their crutches for like two weeks or four weeks. But my dr wanted 6 weeks, so I did it. I am glad I did, though, looking back on it now. It kept me from trying too much or moving the leg in weird ways. And in regards to pain, I did not really have that much! I was super surprised. My leg and hip were tight and crampy, but I was never in “pain.” I was able to just take Aleve to handle it. I slept on my back for the first week or so after hip labral tear surgery, but then I was able to roll on my left side a bit for side-ish sleeping. I’d say after 3-4 weeks I could sleep on the left side with a pillow in between my knees. I did not stomach sleep for probably the full 6 weeks. One thing I was surprised about it how weak my hip flexor was after surgery. I guess they have to move it or something to access the hip joint? But it was so weak after surgery, it was really hard to lift up the leg at all. I’d use my hands to pull my leg into bed. Wearing long pants is good so you can grab those, too. You’ll also want light weight sheets and blankets on your bed because your leg won’t be able to lift them up easily if you try to move around under the covers. Also make sure your floors are clear of clutter so you don’t trip over some random dog toy while you’re crutching around the house. I tripped over random things a few times and it scared me so bad because I thought I might re-tear the labrum. The best thing I bought to prepare for hip surgery was the toilet seat riser. It made getting up and down so much easier since you can only use one leg to do so. I would also sit on it and put on my pants or socks–it made the process so much easier. Hip arthroscopy recovery: How long does it take to recover from hip labrum surgery? I was on crutches for 6 weeks. I could walk unaided after hip surgery after about 4 weeks but kept the crutches per doctor’s orders. I carried a fold up cane for the first week I was crutch free in case I got really tired or tweaky feeling. I started to feel “normal” walking after about 3 months and started a jogging protocol after about 4 months. More leg strength training started at 6 months. I just had my one year follow up with my doctor, and he said it can take up to 2 years for a labrum to fully heal. Especially one like mine, which had the “flap.” I was like “um, what?” Would have liked to know that before surgery, thanks! But in reality, I can totally understand why healing takes so long. There’s minimal blood flow inside a joint, so the tissue takes longer to heal. Some people seem to recover much faster than me. I read blogs that people were running after a few months and going back to pivot sports like soccer. I don’t know if it’s just my situation, but going back in to high levels of activity seems a little scary for me, even at one year after surgery. I am just really protective of the hip now and don’t want to do anything to harm it. Hip labrum surgery recovery is very tiring! Be prepared to be very tired by basic things like walking 300 steps per day on crutches, showering, grocery shopping, preparing meals, or basically anything where you have to stand and move. I can’t even imagine having kids and trying to care for them during this process. Hats off to all those parents out there! Take frequent naps and just realize this is all part of the process. The tiredness started winding down around week 4 when I was able to sleep more fully and gain some more stamina. You will not want to shower for at least 2-3 days after hip surgery for a hip labral tear. Your incisions are still scabbing and you don’t want to get the medical tape wet. So just sit back and relax! The first few days after surgery, I did not feel like I was super gross or stinky. Mainly because I was sitting in one spot and not sweating or anything. So I was able to go the first few days with some face wipes and baby wipes. After several days, I was ready to shower. We have a low tub, so I used a crutch and Ken’s arm to help me get in. I used the shower wand to basically wash around the surgical site so it did not get wet. It was pretty tiring to try to balance on one leg and wash. Some people have mentioned getting a shower bench, but I didn’t get one. I tried to do the bare minimum shower and be as fast as possible. When the tape starts falling off your incisions, just let it peel away naturally. Don’t pull them off because you don’t want to pull off a scab. After the surgical tape is off, you will cover your incisions with regular band aids. Talk to your dr about using things like neosporin. I used it, as well as a Manuka honey wound gel, but that is just what I personally chose to do. A few weeks after surgery your doctor or a nurse will snip out the stitches. It is not painful, but it feels weird, like a pulling sensation. I was in PT for about 4-5 months after my surgery. I went once a week for the first several months, then every two weeks in months 4-5. PT was so valuable because I could ask my therapist random questions. She’d also test my range of motion, pain, and muscle tightness. She massaged the hip every session to prevent scar tissue build up and to release the muscles if they would start to tighten. We did a slow progression through stationary biking, leg lifts, and clam shells in the beginning. After a few months I was able to work in band walks, squats, one-legged squats, and elliptical. Will I limp after hip surgery? Probably a little, yes, especially right after you get off the crutches. You will be babying your hip and leg and won’t want to put weight on it. I used a fold up cane after I was off crutches, especially when I was very tired. But after a few days, you will build up more and more confidence in walking and applying weight to the leg again. When I pushed myself too far, my hip would get really tired and I would have a slight limp. Even one year after the surgery I still sometimes limp when my hip hurts. But I’d say it’s very slight. 99% of the time I can walk perfectly normally! One thing I didn’t know would happen after surgery was constipation. Sorry if that is TMI, but I want you to know it’s a possibility. I think it is the anesthesia that causes it. Couple that with the post-surgery laying around, and your insides just don’t work as well. So be sure to drink lots and lots of water and take stool softeners like Colace or a gentle laxative like Miralax. I had 5 small incisions on my right hip that looked like the letter “Z.” The surgery is minimally invasive, which is awesome. I couldn’t believe they fixed the inside of a joint through these tiny incisions. The scars actually sealed up pretty quickly and with little fanfare. They were really red for a long time. Two of my incisions are white / you can’t see them much after one year. Three are still quite red looking. I am a little embarrassed when I wear a swimsuit that they are visible, but that’s life. We all have scars and scrapes, so I try not to worry about it too much. I don’t try to cover them up with clothing or makeup or anything. I do religiously apply sunscreen to them when I go to the beach so they don’t get more discolored. One year after hip labrum surgery, did it work? This is my personal experience, but did the surgery work? Yes and no. It’s hard to blanket say the surgery was great and life changing because honestly, there have been struggles, pain, and setbacks. I’ll list some of the top pros and cons of hip labral tear surgery that I have personally experienced. -my lower back pain is basically gone. -I do not experience “catching” in my right hip any more. -I can do simple things like putting on socks without groaning. -I can walk 20,000 steps per day with no pain or discomfort. Since surgery I’ve traveled to Costa Rica, Disney World, Paris, Mexico, and Belize and walked all over. -I’ve learned the value of regular massage and hot baths for relaxation and self-care. -the surgeon surveyed me before and after surgery. My before score was 57 and my after score was 84. So they can measure a huge improvement in my levels of discomfort and quality of life. -long recovery: 6 weeks on crutches and still dealing with residual tightness one year after surgery. Using crutches for 6 weeks is a huge pain and it’s very hard to prepare food or carry anything with your hands. -it takes a really long time to get back up to reasonable activity levels like running or weight lifting. And it takes a while to build up muscular strength again. My hip flexor is still a little weak and is prone to tightness. -I am experiencing sharp hip pain at random. Not sure if it’s muscular tightness, something pinching inside the joint again, or arthritis. But it is concerning to have gone through this whole process and still have sharp pain. -My glute and hip flexor are still really tight, so I am still using the PVC pipe to roll out the muscles. I was really hoping the surgery would allow the joint to work more fully and let the supporting muscles relax. Would I have hip labrum surgery again? I actually have a torn left hip labrum, and the experience of having the right operated on is seriously making me consider whether I want the left side done or not. I feel like as long as the left is a-symptomatic, I can handle not getting the surgery done again. My left hip does catch and feels loosey goosey in the joint when I walk. Apparently, the tear is actually worse on the left side, and there is a cyst in the left hip joint. But I started with surgery on the right side because the muscles hurt so bad all the time from being so tight as they stabilized my hip. I am really curious about the sharp pains in the right hip and why they are happening. As long as I am having pain in the right hip, I will not have the other surgery. I would need to know that the right hip is fully recovered and able to support my body weight for 6 weeks on crutches. For now, I am holding tight on the left side and continuing to focus on strengthening and stretching the right hip. 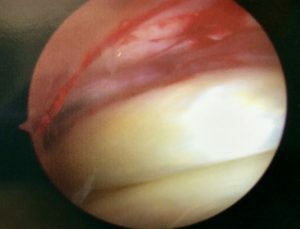 Do you have a torn labrum or have you had hip arthroscopy? I hope my posts have helped you in some way to prepare for hip surgery or to learn more about my own experience with a labral tear. 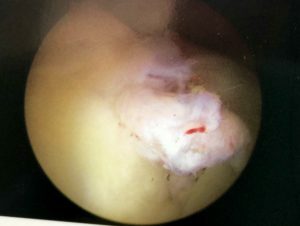 Please leave a comment below if you also have a torn labrum or are considering arthroscopy. I’d love to hear from you! thank you for sharing your story. I am a mom of two on the South Shore,Plymouth, looking at having this same surgery on my right hip. May I ask who you the orthopedic surgeon was at MGH? Hi Sandy! It was Scott Martin. My preliminary appts were at the main MGH campus but my surgery and subsequent appointments have been at the Waltham surgical center. Let me know if you have any other questions about my experience!